The Western seems to have enjoyed a resurgence recently and Getintothis’ Laurence Thompson theorises that a certain Mr Trump may be responsible. With the recent release of The Magnificent Seven remake (what is the obsession with remaking remakes, incidentally? First The Thing, then 12 Monkeys, then Ben Hur, and now this – don’t we have any ideas we’ve only used once? ), it seems the Western has been given a boot up the arse lately. Since the Millennium, we’ve seen everything from conventional-but-competent remakes (True Grit; 3:10 to Yuma), grand epics (The Assassination of Jesse James by the Coward Robert Ford; There Will Be Blood), screwball genre-splicing remixes (Sukiyaki Western Django; Kill Bill vol. 2, The Good, The Bad and The Weird, Django Unchained, The Hateful Eight), geographical re orientations (The Proposition; Dead Man’s Shoes), HBO shows (Deadwood; Preacher; Westworld) and even contemporary crime dramas (No Country For Old Men, series 2 of Fargo, bits of Breaking Bad) that rely or expand upon themes, settings, and visuals associated with the Western. You could even argue the mid-to-late 2000s post-apocalyptic craze – The Road, The Book of Eli, I Am Legend, Children of Men, plenty of zombie nonsense, the Fallout 3 video game – was actually nostalgia for the sparse and lawless desert-scapes once trod by Clint Eastwood and John Wayne, culminating in last year’s best flick, Mad Max: Fury Road. The best movie out right now, David Mackenzie‘s superb Hell or High Water (really, go see it!) is a modern Western, with its gun-slinging action, outlaw heroes, open horizons, Stetson-bearing lawmen and wide-angle camerawork. Not bad for a genre declared dead by the mid 70s, killed by the Trojan horse strain of Peckinpahist revisionism. But why? 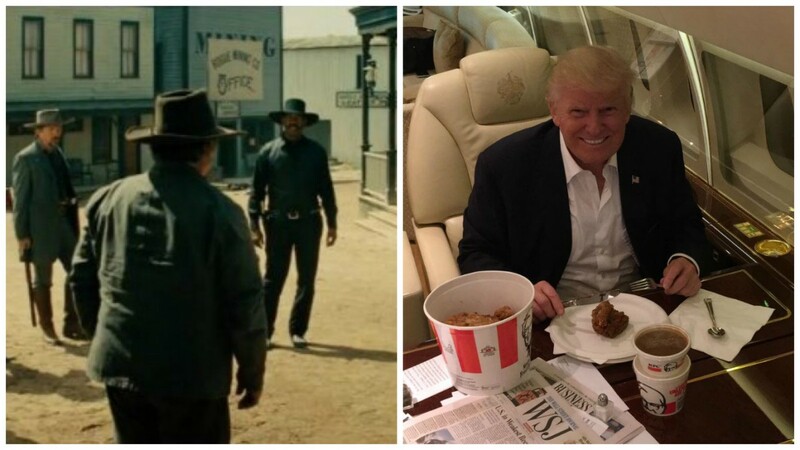 Who do we have to thank for the rejuvenation of this broke-down, worn-out ol’ cowboy of a genre?Donald Trump. No, wait, hear us out. Firstly, the idea that the Western has reclaimed its status astride the saddle of American culture is an illusion. Back in the 1950s, literally hundreds of Westerns were made every year. If there’s a modern equivalent, it’s the superhero movie, with its pop-mythmaking, black-and-white morality and apparently endless popularity, but even then, nothing really comes close to how ubiquitous Westerns used to be. They were practically the default mode for Hollywood studios for decades – in the mid-50s, there were more Westerns made in Hollywood than movies of any other genre combined. Their impact on American identity and consciousness was immense – Robert Duvall once remarked that the English had Shakespeare, and America had Westerns. That omnipresence has ridden off into the sunset, and it ain’t coming back. Secondly, the Western “revival” of the 2000s was likely a different phenomenon to that of the 2010s. The sand, the dirt, the barren wastes, the lawlessness, the killing, the oil (There Will be Blood) of the last decade’s mise-en-scène was really about Iraq and Afghanistan, just like the superhero genre’s preoccupation is with 9/11 (The Avengers, Batman vs Superman) or the Patriot Act (The Dark Knight, Captain America: Civil War). With the Taliban overthrown, al-Qaeda defeated, and the battleground between the US and ISIS unclear and lacking a visual iconography, that’s no longer the case. What they’re calling “the Return of the Western” now is part of a larger American nightmare. To understand this nightmare, visualise Rome in its final days – worn away from within by decadence, the barbarians at the gates, and the order of empire about to fall into medieval chaos. It’s a myth, one the reactionary American right obsesses over (“if we let gays get married instead of carpet-bombing ISIS, where will it all end?”), but it’s also an unconscious acknowledgement of what Giambattista Vico called “corsi e ricorsi”, history’s progression from theocracy and aristocracy to democracy and anarchy, and then back to theocracy again. In contemporary pop culture, the role of the barbarians are played not by Islamic terrorists, but by cartels. Why? Because they have to be at the gates, or in this case, the border. (Or Trump‘s wall.) The Salamanca organisation in Breaking Bad, the Barrera family in Don Winslow‘s novels, the Sonora cartel in Taylor Sheridan‘s Sicario script, the Hispanic drug-dealing villains in Blood Father (Mel Gibson‘s surprisingly good response to Mad Max: Fury Road), and the Medellíns in Netflix‘s Narcos and new Bryan Cranston vehicle The Infiltrator are frightening because of their unremitting savagery, their otherness and their proximity. They are the primordial, Tiamatian chaos to which America fears she may return, as their drugs chew away at the moral fibre of her cities. This fear of the enemy within and without, the insider-outsider foe, is what Umberto Eco identified as a tenet of ur-fascism. Donald Trump‘s speeches about Mexican rapists flooding in are an attempt to exploit this narrative and turn the entire American mentality into the little village besieged by Eli Wallach‘s bandits in The Magnificent Seven, with him as Yul Brynner riding to its rescue. If the Western has benefited from this paranoia, it’s because it’s the scrying glass through which we imagine what America was, and could be. The starkest example is the highly underrated horror-Western Bone Tomahawk, starring Kurt Russell. The villains are a psychopathic pre-modern tribe the Native American Indians have denounced, an ancient society of language-less murderers and cannibals. This is the sequel to the old Cavalry & Indian plot, the attempt to tame the wild country for the white settlers, only for the country to fight back through its sociopathic proxies. That evil. It squats in the borderlands, it lays eggs in the inner-cities – in the deserts, it still awaits, unblinking. Our fascination with it is driving a lot of fun stuff right now, but let’s hope we aren’t driven by fear of imaginary monsters into the arms of a real one.